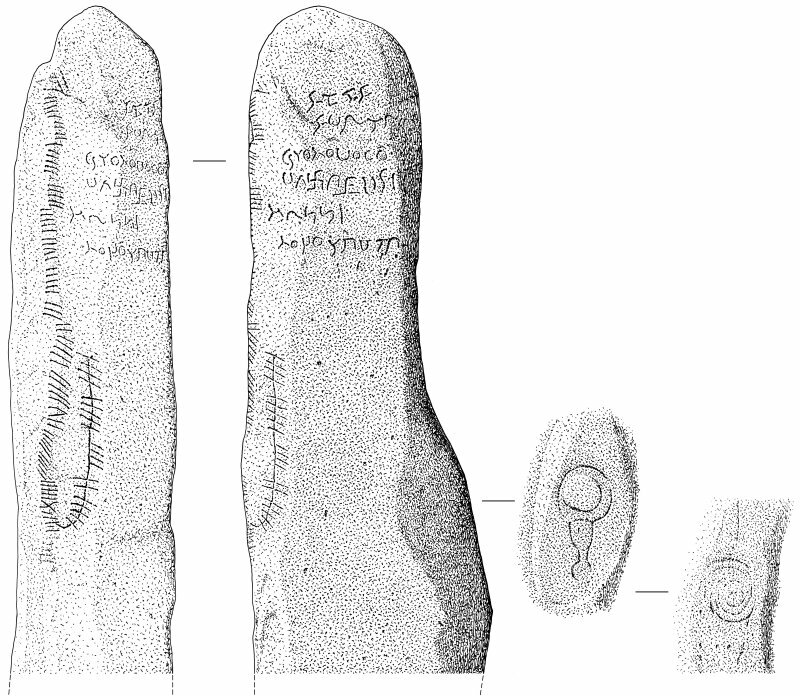 Annotated drawing of stone and enlarged detail of insciption(also annotated). From album, page 34. Digital image of ABD/505/1/P. 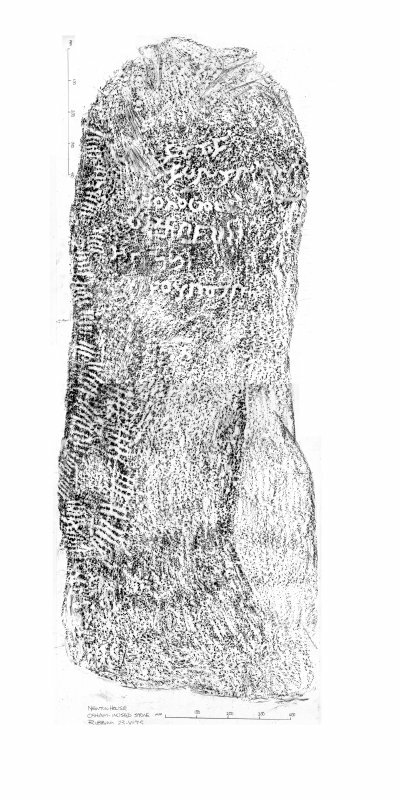 Newton House, composite digital image of rubbing of ogam-incribed stone. Detail of inscription on face (flash-lighting). 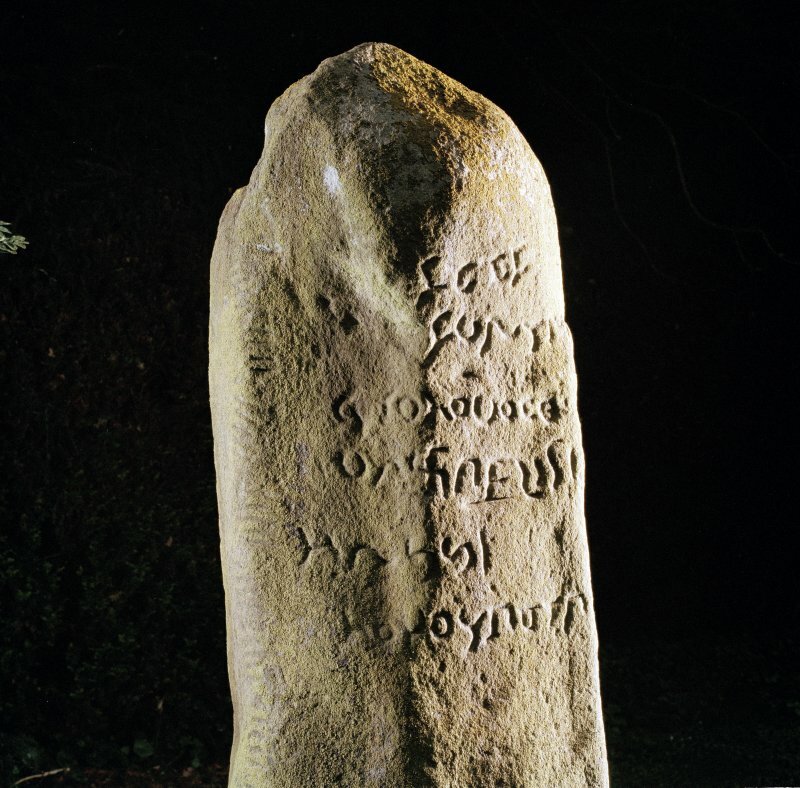 View of inscribed stone, showing inscription on face and ogham inscription along edge (flash-lighting). 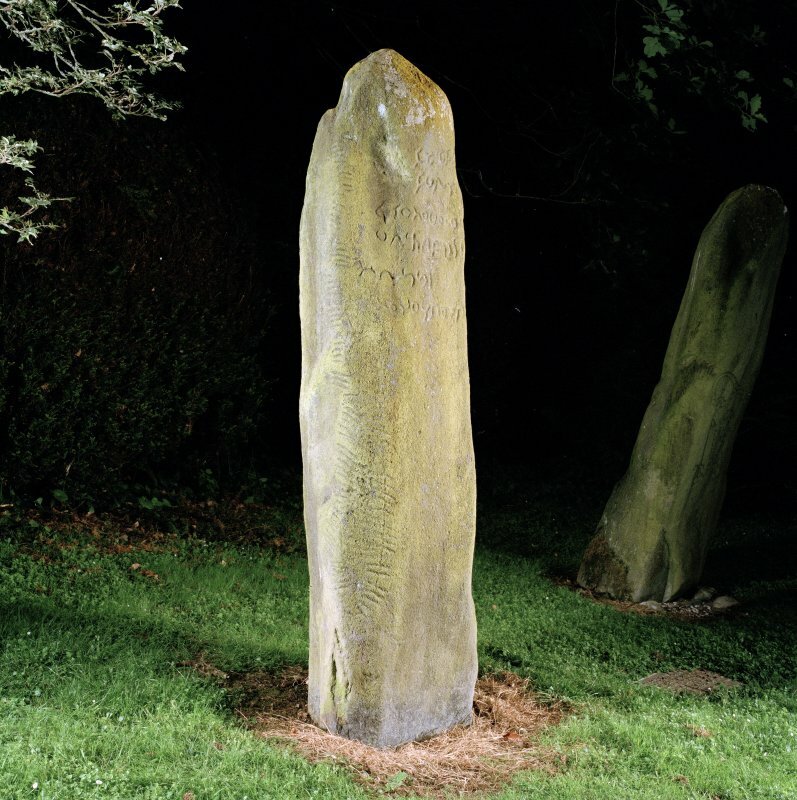 View of inscribed stone, from side, showing inscription on face and ogham inscription along edge (flash-lighting). Detail of inscription on face, from side (flash-lighting). Detail view of the six horizontal lines of half uncial letters on the Newton House Pictish symbol stone. 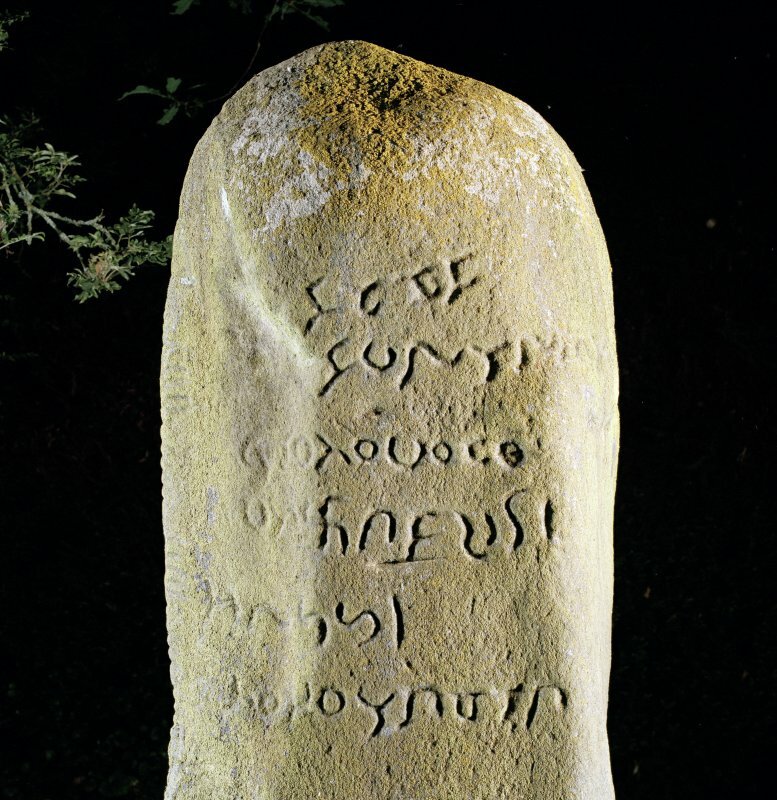 View of Newton House Pictish symbol stone with a Latin inscription. 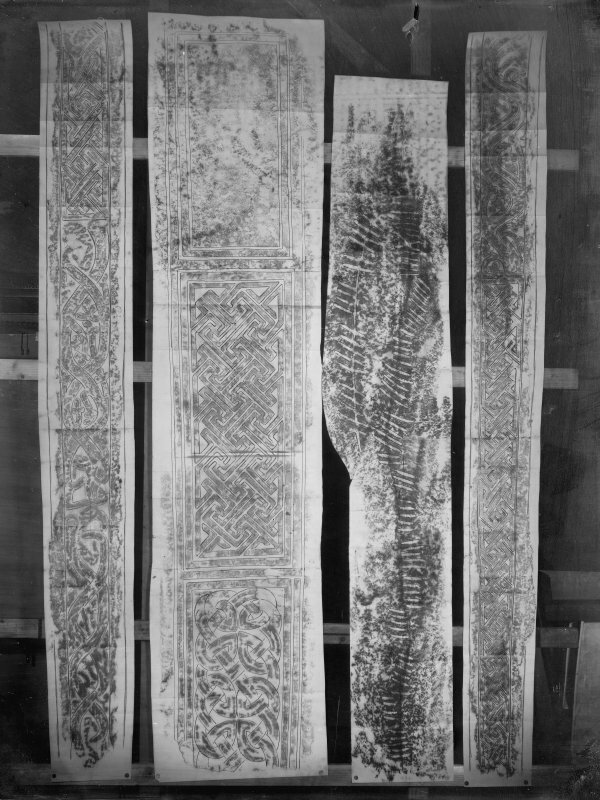 Photographic copy of four rubbings showing St Andrews no.14 cross shaft and the Newton Stone, an ogham inscribed Pictish symbol stone. The left and right carved stones are unidentified. 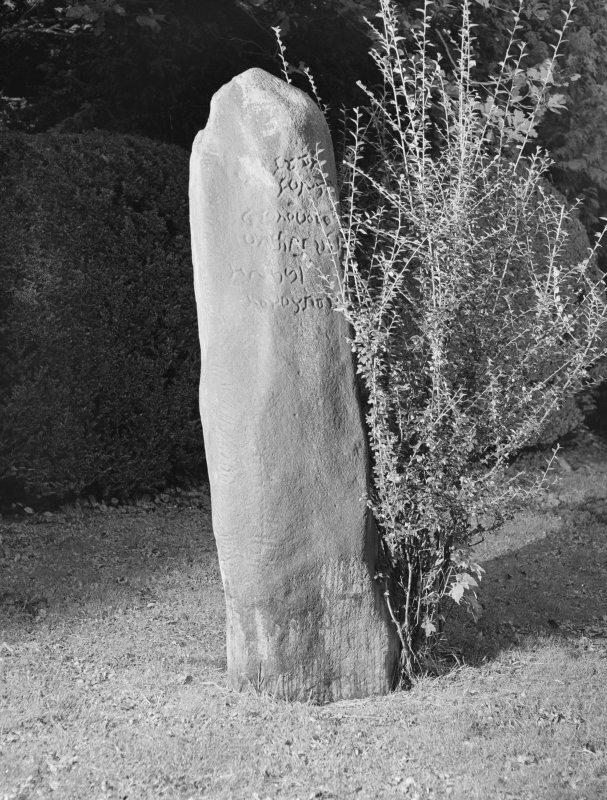 View of ogham inscribed stone, from side, showing inscription on face and ogham inscription along edge. 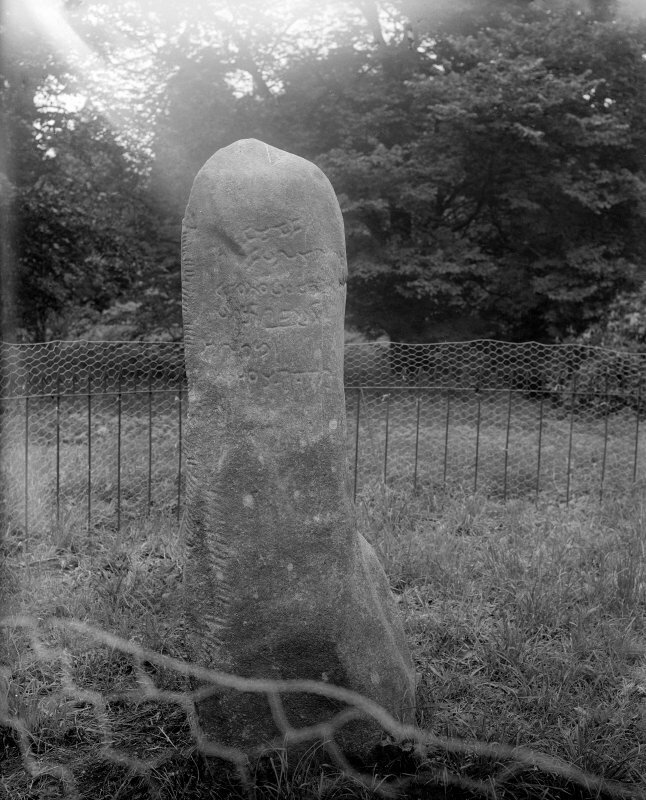 View of ogham inscribed stone (flash-lighting). Present location: still in situ in the grounds of Newton House. Evidence for discovery: found around 1803 and first recorded by John Stuart in 1835 in a wood about a mile from Newton House, and subsequently moved to the grounds of the house (discussed in Forsyth 1996, 420-2). 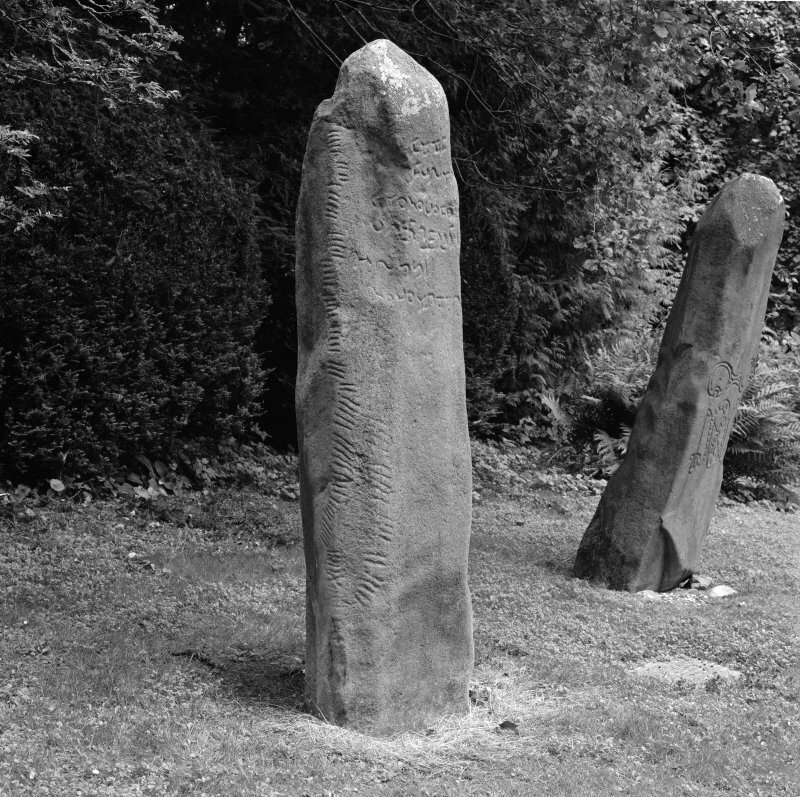 An irregularly shaped natural pillar, its two inscriptions in ogham and half uncials have been long recognised, but RCAHMS fieldwork in the later 1990s revealed that there are also two curvilinear incised designs. 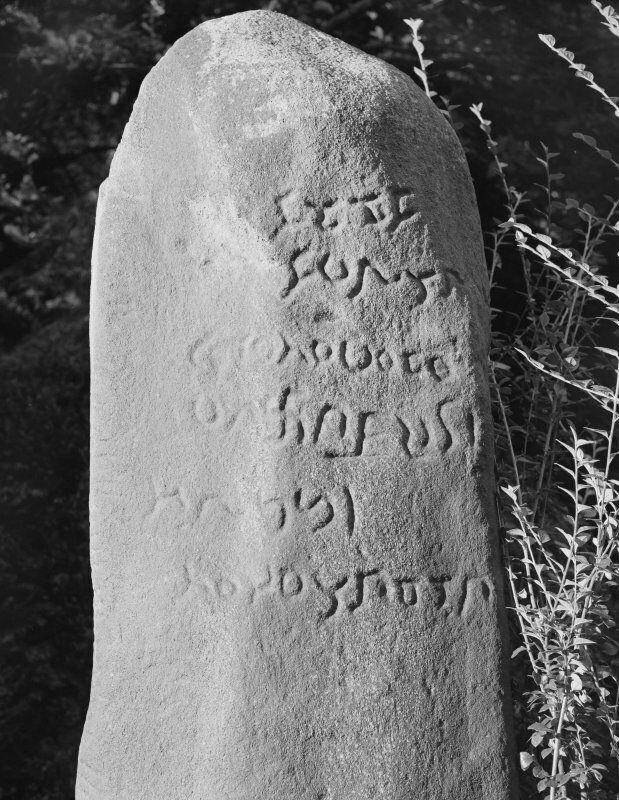 The ogham inscription runs vertically down the stone and curves round to ascend again, and it includes the personal names Idarnon and Vorenn. 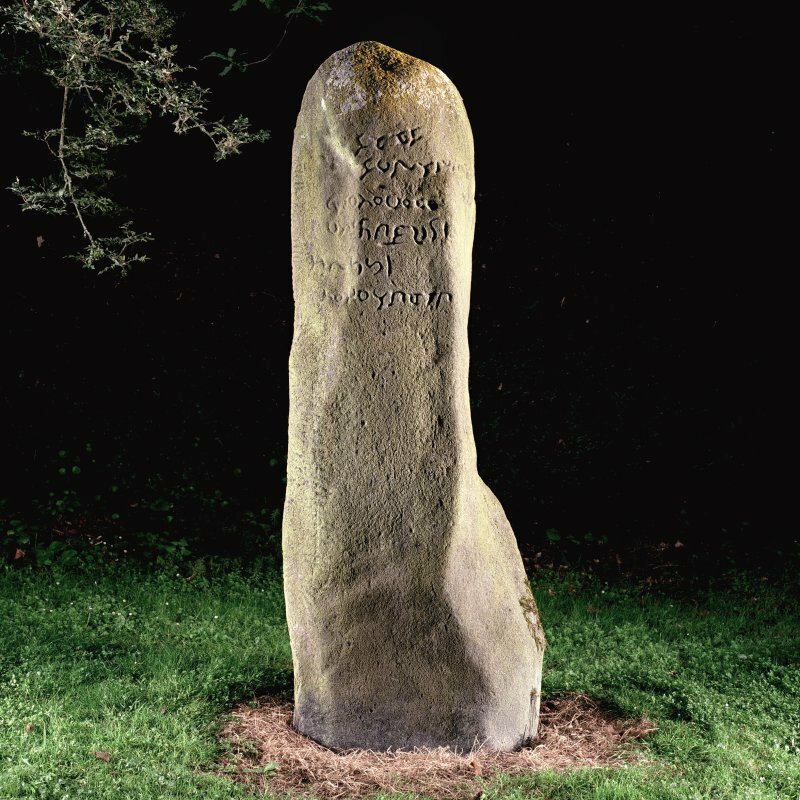 The half uncial letters run horizontally in six rows across the top of the stone, beginning at the same level as the ogham, and it is difficult to read but appears to include personal names. The two inscriptions are thought to be contemporary but not identical (Forsyth 1996, 425, 439). 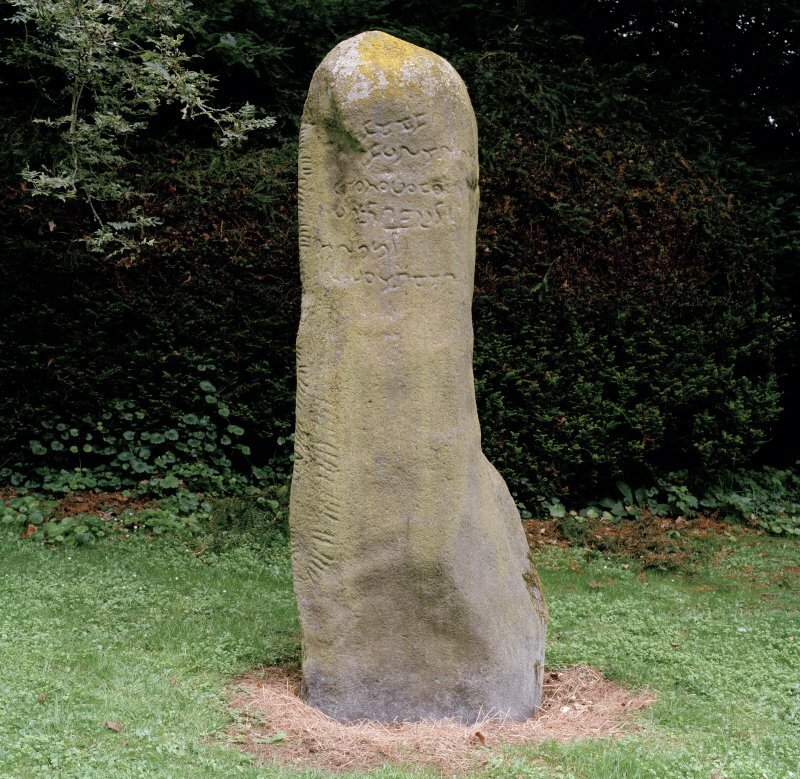 At approximately the level of the curve in the ogham inscription but on the other flank of the stone, there is a roughly executed mirror symbol and a spiral motif. Date: sixth or seventh century. References: Stuart 1856, 1, pl 1; Okasha 1985, 54-6; Forsyth 1996, 420-42; RCAHMS 2007, 118, 125; Fraser 2008, no 38.2. Stones as described; no further information regarding original find-spots, or graves. Visited by OS (NKB) 13 March 1969. 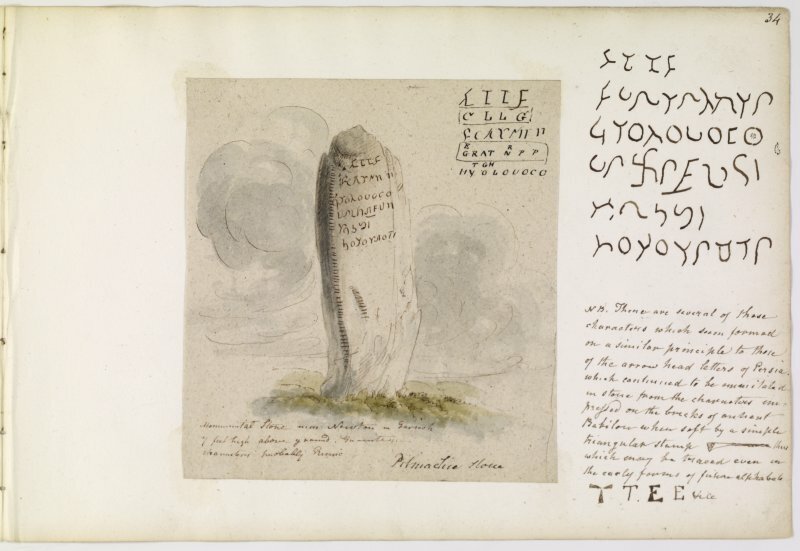 The ogam-inscribed stone (The 'Newton Stone') is of blue gneiss, 2.03m x 0.5m and bears at the top six horizontal lines of characters and an ogam-inscription down the left angle and lower front of the stone. The Pictish symbol stone is of blue-grey greiss. It measures 2.05 x 0.6 x 0.41m and is roughly pillar-shaped, incised with the double-disc and serpent crossed by a z-rod symbol. (Unattributed) information on OS Archaeology Record Card.